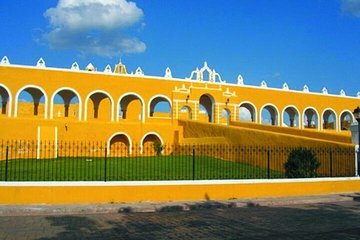 Explorez Izamal, la «ville des collines» du Yucatan, lors de cette visite guidée abordable. Après une prise en charge à l'hôtel, voyagez avec votre guide dans les rues coloniales d'Izamal pour découvrir le passé maya de la ville. Visitez la pyramide de Kinich Kakmo, les ruines de Kaboul et Itzamatul et le couvent d'Izamal lors d'une visite d'une journée. If I could rate this a zero I would. First, they were a half an hour late picking us up. The guide was supposed to be able to speak English, not really. Maybe a few words. Could not understand full sentences of what he was saying. Took an hour detour to some store not on the agenda so people could buy shirts? Finally got to the destination and he did not guide us, we had to just explore on our own since we could not understand him. When we wanted to go to the museum, we had to go search for the guide so he could pay the 50 cent entrance fee. We should have just paid it ourselves and saved the search. Then he had us all gather in a group. He spoke Spanish the whole time and seemed to make jokes at our expense, then everyone laughed at us. No idea what he said. Then we followed the group to horse drawn carriages, the driver spoke absolutely no English. We were put in the back of the carriage with another person sitting in front of us with the driver so we pretty much could not see anything. Once that was done, we wandered around the town square for about an hour until we were called back to the bus. We ended up leaving Izamal and hour early. So, cut off an hour and a half start late, end early and then and hour detour. It was horrible and scary.